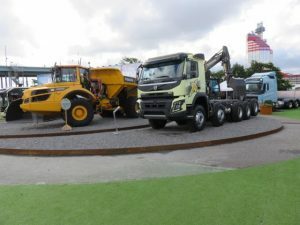 A touch of nostalgia about this photo in that it is probably the final time the complete Volvo Group line-up of vehicles – trucks, buses and construction equipment will be on display at the Volvo Ocean Race (VOR). Once the seven 65 ft boats reach the overall finish at The Hague next week, the Volvo Ocean Race is no more, as we know it. A top management buyout will see an evolution of the sea-to-sea, port-to-port sailing marathon in that new sponsors will be attracted to the bi-ennnial nine month long competition with shorter legs and more frequent stopovers at major ports around the world. This series has witnessed the closest ever contest with three crews/boats in contention for the big prize and subsequent glory namely, MAPFRE (Spain) Team Brunel (Netherlands) and the Chinese Dongfeng Race Team. On each occasion there is always an Irish interest (due to our maritime heritage) and this time VOR veteran Damien Foxhall (Vestas 11th Hour Racing) from Kerry (5 time participant and winner in 2011/12 race) and Annalise Murphy, Olympic Silver Medallist who is participating for the first time with the high profile Turn the Tide on Plastic team. Vestas won the in-shore In-Port Race in Gothenburg. 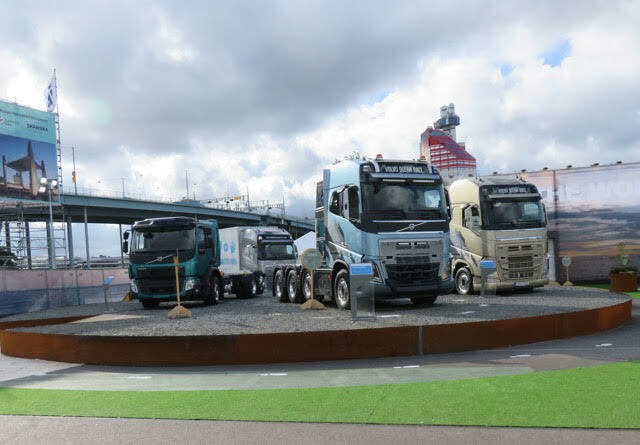 At its hometown stopover, the Volvo Group demonstrated its future green technology with displays and demonstration drives of its new ElectriCity, all-electric commuter bus and launched its new Electric Volvo FE & FL model range trucks that are set to enter production next year.